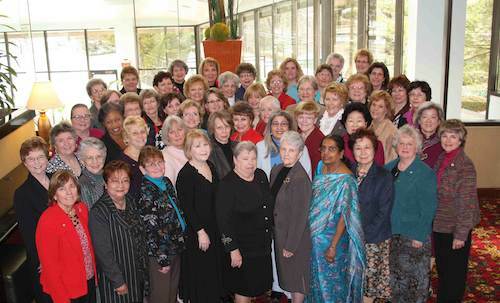 The Auxiliary held its biennial International Auxiliary Presidents Conference this January 14th and 15th in Nashville, TN. All 14 National Association presidents were in attendance representing Australia, Finland, Germany, Norway, Sweden, South Africa, India, Nigeria, British Isles, Brazil, Japan, Korea, the Republic of China and the Philippines. Also in attendance were 37 of the 38 state Auxiliary presidents from the U.S., the four International Auxiliary Cabinet members and 10 International Auxiliary Cabinet Representatives. “We are a ministry that works together with our husbands to reach the lost for Christ. . . there’s not a lot of fluff. As we work beside our husbands, we can make a difference. God honors that. And we honor God,” says Kiethley. For forty days prior to the conference, daily prayer requests for the event were sent from the Auxiliary Department at The Gideons International Headquarters to the attendees. But the planning for the conference began a year ago and since early October, the work that has gone into it has been virtually non-stop. The program messaging was focused on building momentum, increasing momentum and continuing momentum in terms of the work of the Auxiliary. Mary says that the real impact of this conference will be seen in the months ahead, in terms of increased distributions, increased giving and increased membership. The conference had a Faith Fund goal of $8,000. But through the faithful, sacrificial giving of the Auxiliary leadership, the total Faith Fund contribution received was $13,238, all of which will be used to purchase and distribute more than 10,000 copies of God’s Word to the lost. Cindy Creel delivers an inspiring message to the conference attendees. 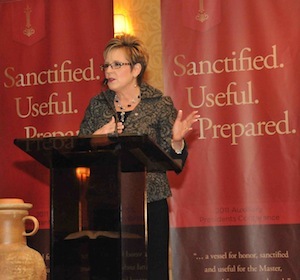 Cindy Creel, International President of the Auxiliary, delivered a very inspiring message to the conference attendees. Tying her message back to the theme verse of 2 Timothy 2:21b, “ a vessel for honor, sanctified and useful for the Master, prepared for every good work,” Cindy related stories about all the vessels in her own home, including her pottery collection. “Ladies, as I look out at all of you, I see many beautiful vessels. I see vessels of honor . . . because I truly believe you have valued the prescription that Paul gave in our theme verse,” Creel said. “He does not see us for what we are, but for what we can be or will be,” Creel explained. Mrs. Kiethley says it was important for the state Auxiliary presidents from the U.S. to meet the Auxiliary presidents from around the world, and to see how Auxiliary members in other countries are risking their lives in some cases to share God’s Word. 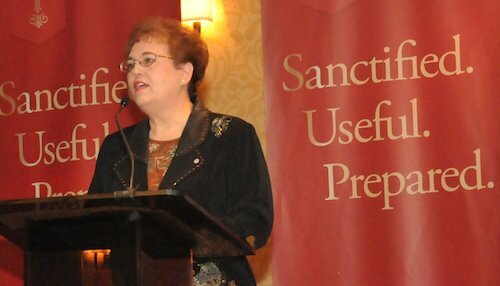 International Auxiliary Chaplain, Rene´ Lucas, addresses the conference. Other guest speakers included Rene´ Lucas, the International Auxiliary Chaplain, as well as Dennis J. Donnelly, International President of The Gideons International and Craig A. Warner, Executive Director of The Gideons International. “The conference was top notch. . . I finally feel like I have a clue about what I’m supposed to do as president,” said Sandra Parker, Auxiliary President for the state of Texas. Mary Kiethley acknowledges that the success of the conference wasn’t something she or anyone else in the Auxiliary could take credit for. It was all God’s work. It truly was a conference that glorified our Lord, and gave us a special taste of heaven! My heart and head are soaring! I had a wonderful time. This was just like heaven on earth. I’m inspired to build, increase, and continue momentum in my state. My thanks to all. Love you in the name of our LORD. It is truly a very blessed experience, to have attended said conference, God’s great anointing was felt all throughout the duration of the conference. I truly thank God for enabling me to be part of it. The conference was indeed a showcase of what a culture of excellence is, in doing God’s work. To God all be the glory even as we thank everyone in the international office who made the conference an amazing success. May we truly be the kind of servant leaders, precious vessels of honor the Lord sanctified and made useful to continue on and be useful & prepared to do good work in the vineyard of the Auxiliary of the Gideons Int’l. With the help of the Potter’s hand, I pray for a continuing momentum in terms of Auxiliary work worldwide, hopefully, prayerfully may it be so also in my country, the Philippines. As one of the attendees I completely agree that God was in control and his presence was continually felt. Everything was top notch. Thanks to all who had a part in the planning and preparation from Mary Kiethley and her staff and the Int’l Auxiliary Cabinet to the Int’l Headquarters departments that also assisted. You did a wonderful job and I was blessed from being a part of this conference. I want to say how humbling it is to know that we are vessels for the Master’s use. I wept as I thought how HE had chosen me to be the Auxiliary President of the state of Virginia for such a time as this. I thank God and the ladies of the state for allowing me this opportunity to grow along with the ministry. The conference was great with the anointing of the spirit and the opportunity to meet my sisters both nationally and internationally. Much thanks goes to all the planning and preparation to the elected international officers, IACR and the Auxiliary Staff. I love each of you. Prayed for you all throughout the weekend. Felt like I was there is spirit. Was wonderful to hear all had a blessed time. NOW it must come down to the camp members so we too can be found sanctified, useful and prepared. God bless you all and thanks for the pics. I prayed for your conference along with countless others. It is so exciting to be reminded again how God is in control and how he brought so many blessings into the lives of all who attended. Now, those blessings will overflow into the membership of the state associations!